The ribeye of the sky. I’d never heard that term applied to a Canada goose, as it was in a New York Times story my friend Sam Hurst shared with me the other day. It’s a good story, about a millennial chef in the Washington, D.C. area who began hunting in order to get closer to the source of his food. That’s an encouraging trend among those in his age group, along with the tendency to blame all of the problems facing the world on my generation, which is not entirely without merit, I’ll admit. But I like the one trend better than the other. Hunting and killing and processing and preparing what you eat is an exercise in reality that can benefit anyone in any age group. It also rewards you with some flavorful, nutritious food, from animals that don’t spend their lives crammed in cages or feedlots or get run through massive slaughterhouses on the way to your table. We still eat some of the mass-produced stuff at our house. But most of our meat is grass fed or free range and generally organic. And the fish and game I hook or shoot adds to that in meaningful, traditional ways. All wild game, however, is not the same, in the wild and especially at the table. In the world of wild game birds, I love the delicate flavor of ruffed grouse and the more robust taste of pheasant almost as much as I love the process of hunting them. My wife loves those flavors, too, which is important since she’s the real cook in the family. Neither of us is a chef, however, so we don’t bring the creative gifts and experience to wild-game preparation brought by Wade Truong, the chef in the Times story. And a culinary gift is what you need, I contend, to make consuming Canada geese more than a chore you chew your way through in order to justify killing the birds. On that point, even Wade Truong prefers wild duck to geese and white-fronted geese to the darker-breasted Canada geese. Me, too. At that point we have to part company, at least for now. That’s because I’m more accustomed to other terms for Canada geese, “sky carp” being among the most common. I’ve used the term myself from time to time, to describe the taste of Canada goose. That’s what I say now, at least, and what I’ve said about goose meat for the last 30 years or so, which is why I haven’t shot one for, oh, 30 years or so. Whoops, I mean I hadn’t shot one for 30 years or so, until last week. That’s a bit of a story in itself, as you might guess. And it begins with an unsuccessful duck hunt on the second-to-the-last day of the High Plains duck season in mid-January. My old buddy Clem and I had a fine day of duck hunting on one of the Black Hills streams that flows throughout the winter, this one just off the northern foothills. We tended the decoys, watched the skies, wandered the environs, commiserated with a group of Angus bulls and considered the half century we have been hunting together. But we didn’t bag any ducks. We only saw about five. We did see plenty of geese however, which led Clem to inquire about shooting them. I told him the season was closed where we were. Or at least, it always had been, in the past years I’ve hunted the late duck season in that part of Lawrence County. Still, as the geese in ones and twos and 10s and 20s made seemingly desultory flights across the landscape, Clem wanted to know for sure. So I walked up to a piece of high ground with my cell phone and left voicemails for a couple of conservation officers. Eventually, the always-responsive Mike Apland called me back, asked my location and told me that goose hunting was indeed open where we were. The area had been added to a different unit this year. Clem was inspired by the news. And so was I, even though ducks were still the prize I wanted. Even one duck would have done just fine. But it wasn’t to be. I could have shot a pair of blue-winged teal, which are odd winter residents here, likely charmed into staying here during the cold months by the free-flowing water and the little macro-climate it creates. But I wanted a mallard. I also could have shot a Canada goose, which flushed from the stream while I was walking along the bank upstream to check other stretches for ducks. But I didn’t shoot. I still wasn’t sure I wanted to shoot a goose, because then I’d have to, well, eat one. Which was not an appealing notion. That’s kind of odd, because I ate geese growing up and liked them, near as I can recall. But I also ate bullheads growing up, and liked them. And I ate prairie grouse, and liked them, too. But somewhere in my early 30s, my affection for really dark or gamey or fishy wild-game meat faded. Not for all dark meat. I still like the taste of certain ducks, corn-fed mallards or pintails especially. Geese? Not so much. Even so, watching them fly around that day revived the old goose-hunting spirit that seemed dead long ago. Besides, we have way too many geese these days. We need to shoot more of them. And we should shoot more of them. At least, that’s what I was thinking a few days after the duck season closed. I was back in the area where Clem and I hunted ducks, this time on an auspiciously located piece of public-hunting ground. It was between a stretch of open stream where the geese tend to collect during bad weather and an assortment of harvested alfalfa and corn fields where they like to feed. It was later in the afternoon before a big cold front would send the previously mild temperatures plummeting to below zero. That’s why I decided to come back and hunt for a goose. I figured they’d be concentrating on that open-water stream and flying low because of the weather. This is fun stuff, by the way, getting all bundled up and getting out in bad weather and slogging around wild lands, with a gun and a purpose. It’s been fun since I was old enough to start doing it with my dad back in Lyman County when I was 10 years old. When I reached my hunting spot this time, the temperature was about 20 degrees. It was snowing and the wind was blowing at about 20 mph, with gusts to 30 or so. It was also blowing from the northwest, and the geese would have to fly into that wind to get back to the stream. This “pass shooting” style of goose hunting isn’t nearly as complicated and not quite so exciting as hunting the big birds over decoys. But it’s still pretty exciting, and it gives you a chance to wander around more than when you’re locked into a spot by a decoy spread. I was carrying the 40-year-old Remington Model 1100 12-gauge shotgun that my first wife’s dad, Keith, gave me in the early 1980s. It can handle 3-inch-magnum shotgun shells. And a serious goose hunter would have been packing some 3-inch steel BBs, which are the preferred loads for pass shooting geese, these days at least. Those aren’t the shotgun loads I grew up shooting, however. Everything was lead shot back then. And my dad had a simple shot-selection formula for shotguns that he passed on to me: 6 shot for pheasants, 4 shot for ducks, 2 shot for geese. The smaller the number the larger the shot. And everything was a standard 2 3/4-inch shell for my dad. He never had a 3-inch-magnum gun, and never figured he needed it. Based on what I witnessed, he didn’t. Things changed in the early 1980s when the state Game, Fish & Parks Department began imposing lead shot restrictions because of documented poisoning of waterfowl and other birds that ingested the metal. Steel shot doesn’t poison the environment or its wildlife. But it is lighter than lead and can be a little trickier so shoot. Because steel is lighter, hunters are advised to use larger-sized shot than with lead. So with steel, BB-sized shot or even BBB are recommended for geese, especially for pass shooting that tends to be a greater distances than hunting over decoys. But I haven’t bought a box of steel BBs in decades. I do shoot 4s, 3s and even 2s in steel for pheasants, especially later in the year when they’re wilder and most shots are longer. And I had one 2 3/4-inch steel 2 left from pheasant hunting, along with a couple of steel 3s and a half box of steel 4s. I decided not to buy any steel BBs for this goose hunt, but instead would limit myself to shots that were close enough where I figured a steel 2 or 3 would kill a 12-pound goose. And I really wanted to shoot a goose with that single round of 2 shot, as a sort fo tribute to my dad and his shot preference. I think he would have liked that. I also liked the idea of shooting that steel deuce out of the 1100 Remington my former father-in-law gave me. Sentimentality matters in hunting. Memories matter. And I was sorting through a series of recollections as I parked my SUV, slipped on several layers of clothing, hung the binoculars on my chest between the third and four layer and loaded the Remington — with the 2 shot in line to fire first. Moments later, I was standing in the public-land shelterbelt, with my back to the wind and my eyes on the ridge line to the southeast, where the geese would appear, if they were going to show. Waiting and wondering is part of the fun in pass shooting geese. So is moving from one spot of concealment to another, trying to find the right flyway. And as the geese started to move, I began playing that repositioning game, one I played in the Missouri River breaks near Chamberlain when I was a teenager. During one of those hunts, I saw what I think was the longest goose shot of my life, by a kid from Chamberlain named Wade Simonsen. Wade tagged along with my friend, Larry Marsh, and I for a goose hunt on the river breaks down near the mouth of the White River. And the geese were flying off the river as we hustled on foot from our car on a nearby gravel road across a pasture toward the breaks. Most of the passing geese were ridiculously high. One loner, however, was, well, still high, but not completely beyond question. “Try him with that 10 gauge, Simo,” Larry said, as we hunkered in low spot. With that, Simo rose to his knees, raised the heavy old 10-gauge side-by-side to his shoulder and pulled the trigger, rocking backwards from the recoil of the blast. Time seems to suspend during long shots like that. And at first, I thought Wade missed. But after an instant delay, the goose was rocked by the shotjerking sidewys in flight. Yet, it flew on. Simo fired the second barrel, and after another delay the big bird was again wrenched from its flight rhythm. But this time it fluttered sideways and came cartwheeling down from what must have been 60 or 70 yards up. It landed with a heavy “thud” in a nearby patch of buckbrush. We talked about that shot for years. Half a century later, I can hear that “thud” when I think about it. Back then, I couldn’t have imagined pass shooting honkers just a half hour drive from the ski slopes of Terry Peak, in February. But there I was, playing the same waiting game, with the same adolescent flutter of excitement. And I didn’t have to wait long. The geese got serious about heading home to the creek, and soon they were passing to the left and right of me, just out of range. I repositioned myself once, then again, and then jogged to the far west edge of shelterbelt, arriving just after a group of 15 or 20 passed well within range. Another group, though, was right behind them and coming at me. It slid on the wind a hundred yards away, then drifted back toward me to within 80 yards, 60 yards, 40 yards. I backed up farther into a cedar tree for concealment, checked to make sure the round of 2 shot was chambered and ready and looked back up to see the first three geese in the skein come around the tree, 30 or 35 yards out. 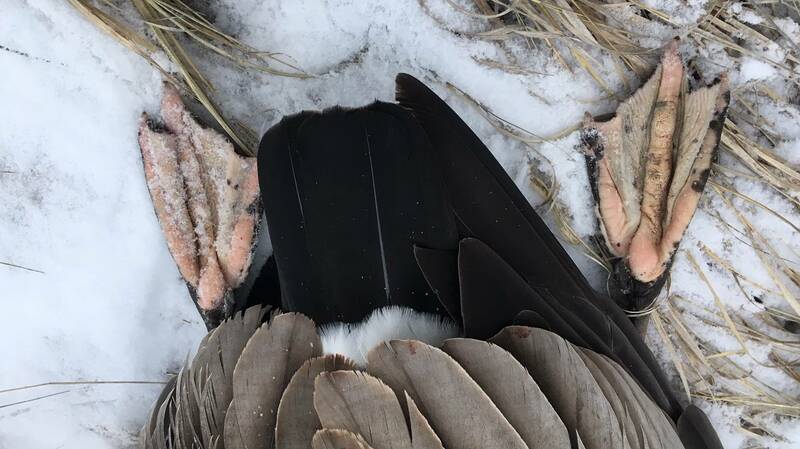 I stepped out from behind cedar, shouldered the shotgun and found the head of a goose, sweeping the sight bead out slightly in front of its beak as I squeezed the trigger. The goose fell hard, and I swung up on an even-closer goose as it flared up and away at the shot. It was another good shot, and the daily limit on Canadas was four. But I took my finger off the trigger and watched that goose and a dozen others lift up higher, catch the wind and sail off for a hundred yards or so, to regroup and begin pounding their way toward the creek again, well out of shotgun range. I retrieved the dead goose and hustled back to the shelterbelt. There were more geese coming, and more ended up over me and off to the west, again within range. Again, I decided not to shoot. it’s good advice, that quitting while you’re ahead. Besides, it was almost sundown. So I lugged the goose back to the SUV, thinking at the time that I was happy to be carrying my 9-pound shotgun and just one 12-pound goose, instead of four. And I drove home happy about the hunt and considering ways to make the goose meat palatable to me, Mary and Jackson. After some time online, I decided to skin the bird and carve it up into cubes, then go with a crock-pot recipe I’d seen on a website. As you might expect, it involved a marinade of soy sauce and Worcestershire sauce, garlic and other spices, then a layer of onion soup and cream of mushroom soup on top of the goose, and about eight hours in the crock pot. My old pal at the Argus Leader, sports writer Mick Garry, says they call that “crock pot gray duck” back in Minnesota. I didn’t think it was horrible, spread on quinoa and served with a salad. But neither was it likely to inspire me to go goose hunting anytime soon. Which is too bad, because there really are too many geese around, and that pass-shooting revival was kind of fun, after all these years. I was considering all that when I got the email from Hurst linking the story that Canada goose was the “ribeye of the sky.” It was the usual high-quality Times piece, and it got me thinking: Maybe all I really need is the right recipe. I mention it to Mary, who looked skeptical, then interested, then held up her hand. She likes to cook, and doesn't run from a challenge. It was a recipe for pickling goose and turning it into cold sandwich meat. Not exactly the “ribeye of the skies,” but maybe more realistic. “Actually, this might work,” she said, warming to the mission. So, pickled honker? Why not? If it doesn't taste too much like liver, I might even buy another box of steel BBs.